BTC 200 MA: Will it hold? I am currently watching the 200 MA daily of btc. Its around 4600 and so far we are above it. That seems a very significant price point. I am overall expecting a very violent upmove and crash. We have done this every time in the bear markets so far to end it. The jump above 5k may have been it, but i think this move will go on a few more days. What are your thoughts on price action now? 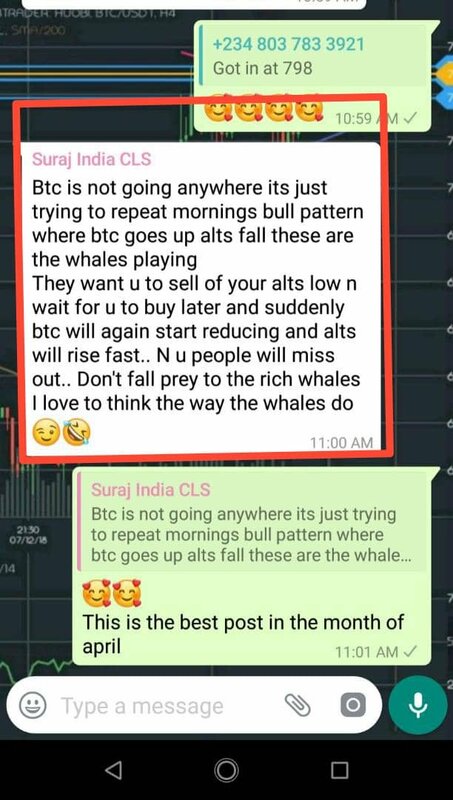 Well I think definitely that the cryptowinter is over and there are lots of bulls ready to buy cryptos. I think this is a good moment to buy thinking about the long term. You got a 25.92% upvote from @brupvoter courtesy of @discernente! The 200 day MA is definitely a major key point for us, but I'd rather go with the previous resistance at ~4300$. 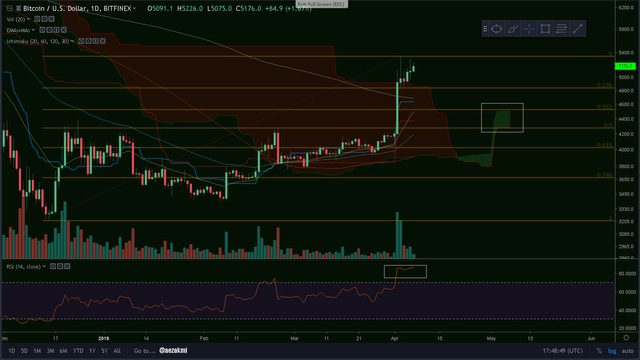 Notice how the Ichimoku support cloud aligns perfectly in the 0.382 & 0.5 Fibonacci retracement channel, which is exactly (like magic) at the previous resistance level. The RSI is way too high, so a correction will most probably going to happen. @knircky has set 5.000 STEEM bounty on this post! @aezakmi has earned 3.675 STEEM. 3.675 STEEM from the creator of the bounty! @masterthematrix has earned 0.189 STEEM. 0.184 STEEM from the creator of the bounty and 0.005 STEEM from the community! @bengy has earned 0.187 STEEM. 0.184 STEEM from the creator of the bounty and 0.003 STEEM from the community! @citizenkane has earned 0.184 STEEM. 0.184 STEEM from the creator of the bounty! @abdulmanan has earned 0.184 STEEM. 0.184 STEEM from the creator of the bounty! @discernente has earned 0.083 STEEM. 0.083 STEEM from the community! I think BTC just established itself a new trading range between 4400$ and 5000$. I expect some choppy high volatile consolidation patterns in this range. If BTC can maintain its new support zone around 4400$ (old resistance becomes new support) than this move could potentially be the start of a new bull market. At least one argument of the bears is gone... BTC now managed to make a new higher high and a higher low! Excitement is coming back into the space which is awesome! Ich rufe hiermit den finalen Boden aus. Von jetzt an geht es zum Mond. Allerdings nicht so schnell. Es bleibt spannend aber den Boden jetzt schon ausrufen ist mutig. Ich hoffe natürlich das du Recht behälst! It was pretty weird to wake up to this! Anyway, for what it is worth, I think people will be taking profits in the next few days... It's coming back down. Hopefully ending up a bit higher than before. Although that said, it is hard to rule out FOMO after such a long period of low prices.. I am currently looking at the weekly 200 EMA which It is currently about 4130. If we can keep this week above it, ideally open and close the next week above to, I may finally conceit that we are out of the bear market. This sudden up move is indicating a sudden fall move too. People are saying we are out of the bear market, but I think we could go down again to ensure further up move. If 200 Ma holds for at least 4 weeks, we may have survived the longest bear market. Put on your space boots, we are going to the moon. There will be plenty of turbulence along the way, but just hodl on a little longer till we get up past the atmosphere. For me, I believe it is to power up, for long term investment. For immediate gains, I think games can do the trick. Which game you want to spend the time to will make a big difference. @knircky, Now waiting period is extending more and more. Let's hope that we can see the stable uptrend and it will continue effectively. What rise to rapidly can decrease the opposite and is not always organic! I think Cryptocurrencies are the future. Bitcoin ist not the best and fastest Cryptocurrency. But I think that the value will increase. Bitcoin will be a stocket market index for Cryptocurrencies like the Dow jones for Shares. I'm not an experienced crypto trader. I've never even had a stock trading account. But I do some buying and selling. Bitcoin Cash has been the leader in gains. I remember some fights regarding Bitcoin Cash & Bitcoin SV. Maybe these fights led to an artificial pump. I'm thinking this too is temporary. I don't see any exciting ground breaking news. So I'm in the wait and see mode. You just got a 3.88% upvote from SteemPlus! Like a few days before the price hike, the network activity on the btc blockchain increased drastically, even causing transfer fees to go up... So i wasnt surprised when a few days later bitcoin price had to shoot up. I just see it as a balancing mechanism for the increased no of transactions on the blockchains, which from the obvious direction of price movement shows that a lot of buying activities have been going on on the bitcoin blockchain. To me, no big deal on the price. That's picture says it all. I think if you predict strong growth and then a crash with crypto currencies you can only be right. That is somehow the nature of crypto currencies. this move does not seem very organic. I think we will soon be back below 4000$. What is interesting is that BTC is now outperforming the altcoins. As you mentioned, every time a bear market ended it went up and down very violently. So that´s exactly what I want to see, but my hopes are already very high.